Filed to: who will think of the bees?Filed to: who will think of the bees? I'm walking the dogs and run into a telephone company repairman standing on the sidewalk. "Watch out for that telephone box — it's full of bees!" he yells. I walk the dogs around it and see he has two cans of RAID in his hands. "Does this happen a lot?" I ask. "Oh yeah," he says, eyeing the in-ground light green box which I now notice has bees buzzing all around it. So the phone company is regularly running into entire clans of bees and killing them dead with RAID. 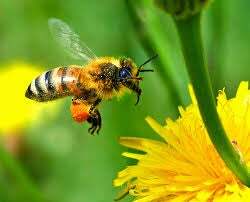 THE ENTIRE BEE POPULATION IS IN DANGER AND THE PHONE COMPANY IS REGULARLY GASSING THEM WITH TOXIC POISONS! Does anyone else see a problem with this? What does one do? One does not want to get some poor telephone worker in trouble who is just trying to do his job and not get stung to death, so a simple phone call will not suffice here. Do you think the phone company has a formal policy to deal with bees in phone boxes humanely? because IT DAMN SURE OUGHT TO.